November 25, 2005 - I hope I don't have to explain who Harry Potter is. If I do, I won't. Query it on Google and come back later. Here we are with the fourth Harry Potter videogame, just in time for the Holidays. Talk about milking a cash cow. Just how much money does this lady need? I'm talking about creator J.K. Rowling, who I confuse with Lord of the Rings author JRR Tolkien, and Judas Priest guitarist, K.K. Downing. I do like the series and although I haven't read any of the books I've seen the movies. I guess I'm just "a fan" and not a 'freaking freak fan." In any case I'm also a gamer and that gives me license to work a little magic of my own on the Harry Potter license. Let me begin by informing you that the gameplay is very straightforward and simplified. It falls under the category of an interactive movie. It's linear and it moves along at a quick pace buffered by cutscenes that keep the storyline central to the gameplay. The game follows the plot of the movie, which is tailor-made for a videogame in my opinion, but manages to elaborate on situations to extend the gameplay without resorting to filler. Lord Voldemort captures Harry with the aid of the ghostly Death Eaters. He explains that Harry's mother died trying to save him but cast a spell that backfired on Voldemort. With the aid of a magic elixir he has been able to remain alive and with the aid of the Death Eaters he will attempt to exact revenge. Things look pretty grim for Harry and his gang. I'm sure this movie will scare the bejesus out of a lot of kids. Harry is also selected to take part as a contestant in the TriWizard Tournament which sees him perform a variety of tasks which require his developing warlock skills. He will have to fight a dragon, ride his broomstick through trying conditions, save his friends from danger and make his way through a giant labyrinth. It all makes for a great movie but if you've already seen it, you might be disappointed by how basic these missions are adapted for gameplay. It's fun to relive the movie and that's about all you're going to get out of this when all is said and done. The linear nature of the gameplay ensures that you will be forced into the various scenes as the director and developer intended. The puzzles and mini-games are fun but they are like eating candy floss; there's not much nourishment. 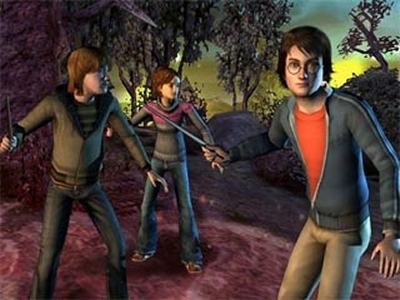 You can play as any of the three characters, Harry, Hermione or Ron. When you switch among them the AI will take over. The other characters do tend to get in the way and they're not particularly brilliant when it comes to doing the right thing. The levels that just feature Harry are the most fun in the single-player mode. Much of the combat is button mashing. While it feels good to be empowered thusly it takes the challenge out of the game. To make things even more condescending, the spells that you acquire are automatically loaded for you depending on the situation. When you need to levitate something, the levitation spell is automatically chosen for you. You don't have the ability to make these decisions nor can you combine spells to create more complex hybrids. Unless all you want to do is get through this game as quickly as possible, these features aren't doing anyone any favors. It may be interesting to play the three-player co-op mode, as it's certainly more rewarding than having the AI take over the other characters. It plays out like a dumbed-down version of Gauntlet but if you've got two pals over at your house and you're looking for something to do for a few hours you could certainly find a worse time waster. The locations look great. You'll get to visit many of them although you don't have the total freedom of 3D exploration. The colors are vibrant and the characters are well rendered with fluid animation. You can't control the camera angles and you'll be subjected to occasional leaps of faith and offscreen hits from enemies. Particle effects are put to good use during spell castings with great lighting and animated effects. The music is perfect for the game and the voiceacting is decent. I would recommend renting this game for a weekend. Although there are a lot collectibles to gather you may not care to replay the game just to compulsively collect everything. The rewards are just not worth the effort in my opinion. Otherwise it's a good revisiting of the movie or novel. All the Magic of the Movie - The magical world of Harry Potter comes to life with in-game characters that look like their big-screen counterparts, cinematic environments, captivating gameplay, and a compelling interactive experience. Compelling Rewards System - Increase the power of Harry, Ron, and Hermione with collector's and Creature Cards. Impressive character models and lighting effects will please even the staunchest Harry fan. We'd like more control over what spells we can cast and when, rather than having them be context sensitive. Too much button mashing. The voice acting is decent but the musical score is even better. The free roam exploration of Hogwarts is gone, replaced by a more restricting level structure. 3 player co-op is just what this game needs though. With the recent release of the sixth children's wizard book, Harry Potter and the Half Blood Prince, we here at Cheat Code Central are going to pay homage to Harry and his puberty laden comrades by previewing EA's new game Harry Potter and the Goblet of Fire. For those of you in the know, GoF is currently being filmed as the 4th Harry Potter motion picture. So that makes this game more of a game based on a movie which was based on a book that someone's great grandma who knows their uncle but who's also their sister wrote. That's creepy, but is it as creepy as a bunch of kids running around with magic wands? You decide! HP: GoF will have you running around as one of the three wizards, Harry, Ron or Heriome. If you're familiar with some of the HP titles in the past, don't expect this title to be puzzle ridden. EA took HP: GoF in an action direction. However, cooperation will become a key factor later on, as you will eventually meet up with the other two wizards and continue the game as a trio. At this point, up to two other players can join in for a 3-Player Co-Op. Some other nifty gameplay features show Harry riding his trusty broom stick. (Ok, keep any gross innuendos to yourself, that's what I'm doing). For any wizard or witch, your broomstick is your primary source of transportation. The broomstick has also been a source of action in past Potter stories. However, EA dropped the ball here. With more games, and gamers, yearning for free roaming game play, players are going to be disappointed when they find that the only control they have over the broomstick is your typical up down, left and right and a turbo boost. You'll be stuck on a pre-determined path as you race against dragons and other broomstick blazing wizards in order reach your destination. 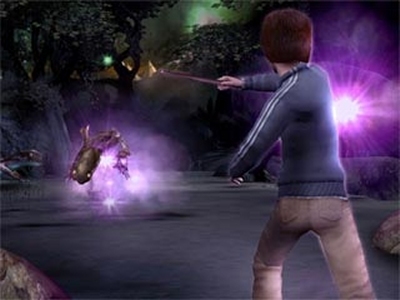 I'm not saying that Harry should be committing Grand Theft Auto, or grand theft broomstick, but it would have been nice to be able to use the broomstick to move between different areas of the game. Or maybe a little bit more action, at least more than racing as fast as you can. HP: GoF features a neat little spell system too. As one of your favorite wizards, or witch, you will have a choice of 3 spells to cast: Jinx, Charm and Axia. Charms will help you affect your environment, such as lifting objects or enemies. Jinx is your attack magic and Axia can summon entities. I don't expect this title to be very popular amongst people outside the Harry Potter fan base. Even though Harry Potter is pretty popular amongst the younger audience, the action oriented gameplay and spell casting system could disorient the younger crowd a bit. That shouldn't matter as EA is destined to make some bucks off the Harry Potter name alone, regardless if the game is good or not.